This week marks the release of Angelina Jolie’s film about Louis Zamperini based on Laura Hillenbrand’s 2010 bestseller, Unbroken. 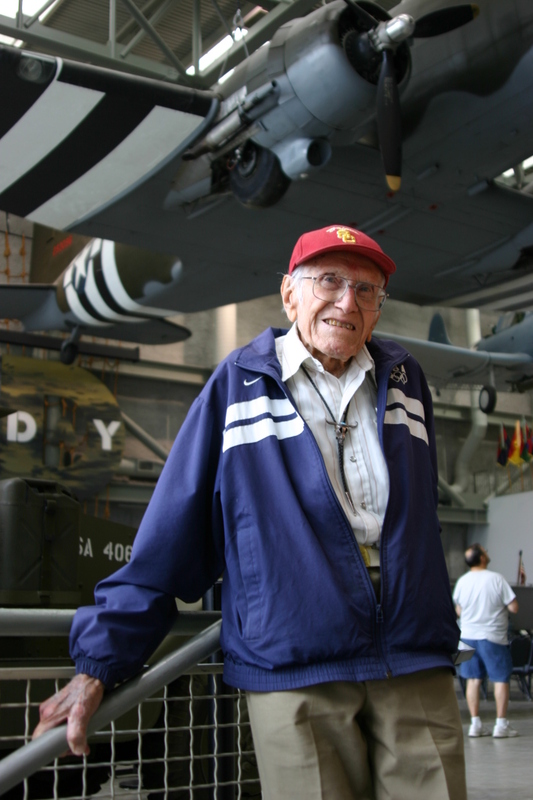 Mr. Zamperini shared his emotional story with the Museum in the form of an oral history in 2011. It can be viewed in our Digital Collection. Zamperini, an Olympic track runner, served as a bombardier in the 307th Bombardment Group, 7th Air Force, flying B-24 Liberators in the Pacific. Zamperini’s aircraft went down in the Pacific and he and the two other survivors from his crew were adrift for 47 days. Captured and tortured by the Japanese, he survived the war, regaining freedom on August 20, 1945. Zamperini was one of the 34,648 Americans held prisoner by the Japanese during WWII. Nearly 40% of those men died in captivity, a staggering 12,935 lives lost. Read more about the Museum’s collection Pacific Theater POW artifacts and the story of the Ofuna Roster. Visit the Museum on Wednesday, January 21, 2015 for a Lunchbox Lecture on the Ofuna Roster and the ties to Unbroken and Zamperini’s story.